A clinically proven method to reduce pain using electrical stimulus. Transcutaneous Electrical Nerve Stimulation (TENS) is a noninvasive therapy indicated for the symptomatic relief from, and management of, chronic intractable pain and post-surgical and post-trauma acute pain. For over 30 years, the medical community has used TENS Units as a safe and effective alternative to pharmacological approaches to pain control for many patients. TENS Machines have minimal side effects and is non-addictive. New Improved DEEP pulse ION technology - New Stick on Electrodes for deeper frequency delivery to problem areas. Free E-mail and phone support. The New Wellness Pro Plus is made with the FUTURE in mind. Years ahead of any other device on the market. Easier to USE! Better, faster, even more accurate. New high tech components allow for more advanced frequency delivery and unit capabilities. Modular. The Wellness Pro Plus can expand to other types of electrotherapy modalities and devices in the future. 1 Fisbain D, Chabal C, Abbott A, et al. . Transcutaneous electrical nerve stimulation (TENS) treatment outcome in long-term users. Clinical Journal of Pain. 1996;12;201-214. 2 Chabal C, Fishbain D, Weaver M, Heine L.. Long-term transcutaneous electrical nerve stimulation (TENS) use: Impact on medical utilization and physical therapy costs. Clinical Journal of Pain. 1998;14;66-73. 3 Erd M, Erdogan A, Erbil N, et al. . Prospective, randomized, placebo-controlled study of the effect of TENS on post-thoracotomy pain and pulmonary function. World J Surg. 2005;29;1563-1570. 4 Bjordal J, Johnson M, Ljunggreen A. . Transcutaneous electrical nerve stimulation (TENS) can reduce postoperative analgesic consumption. A meta-analysis with assessment of optimal treatment parameters for postoperative pain. Eur J Pain. 2003;7;181-188. 5 Facchinetti F, Sforza G, Amidei M, et al. . Central and peripheral beta-endorphin responses to transcutaneous electrical nerve stimulation. NIDA Res Monograph. 1986;75;555-558. DISCLAIMER: Not all the statements and information contained on this page or on any page of this website have not been evaluated by the FDA. The products described on these pages are not intended to diagnose, treat, cure, or prevent any disease. 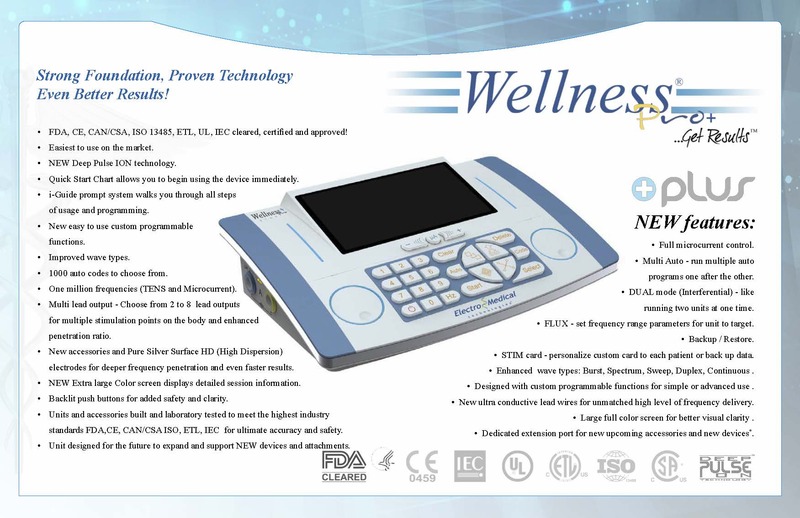 The Wellness Pro is an FDA Cleared Medical Device that is a Tens Unit for Pain relief only and federal law requires a Prescription by as licensed practitioner for personal use. Caution: Federal law restricts this device to sale by or on the order of a practitioner licensed by the law of the State in which he/she practices. "Testimonials represent a cross section of the range of results that appear to be typical with these products. Results may vary depending upon use and commitment."